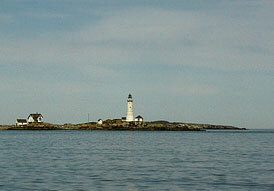 Cruising from New England (Martha’s Vineyard) to the Out Islands of the Bahamas in a Cal 28, from October, 2003 to August 2004. We awoke after New Years to another beautiful Bahamian day. 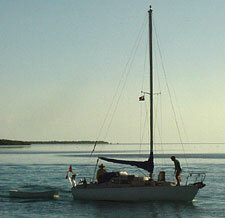 Today we were going to cross the Great Bahama Bank, 57 miles of ocean between 6 and 12 feet deep. The Northwest Channel, the eastern most part shouldn’t be done at dark as there is only a small opening between two very dangerous reefs. Most boats end up anchoring somewhere miles from land due to the vast amount of ground that is unable to be covered in one day. I wanted to get going early as we would be slowest boat in our four boat armada. Sirius, Highlander, Freedonia and Bumbre would all be crossing the bank today and we hoped to anchor together for safety sake. After going over and getting the scoop from some dive boats on the “local cut”, the way out of Bimini harbor at low tide we decided to head off. Jen wasn’t to sure about leaving before high tide, but I knew that if we wanted to get across the bank in two day we better get going so we headed out. Everyone else would be following at various times, but we were the guinea pigs to try the “local cut”. I follow the direction on how to get out, but before I got to the critical point, I bailed out and left the “high tide” way. I did this for two reason, the first was that I saw I was past the shallowest part of the channel entrance into Bimini and the second reason was there was a 50 sailboat hard aground directly in my path on the “local cut” route so I figured it was safer to go the old fashion way. We didn’t get going until; 8:55 , and really didn’t know where we were heading, just thought we would go until we found a good anchorage. So off we went past Amelia Island, and soon we were approaching the St. John’s River, which heads down into Jacksonville. We knew we wanted to get south to St. Augustine so we just headed straight across the St. John’s River and kept heading south. I woke up early the next day, around 5AM hoping to be able to sneak out of the creek before day break. Up on deck I decided it would be wiser to wait for some more light before venturing out. 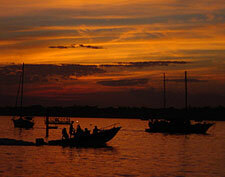 So at about 5:55AM when the light of day started to brighten the horizon to the east we headed out of Indian Creek. Jen was just getting up, but if we wanted to have any chance of making Norfolk that day we needed to maximize the light of day. There we were, all three of us–my dad, Jen, and myself–lying in our respective beds. I was listening to the rain patter on the deck wondering thousands of things at once: “Did I forget anything?”; “Is it going to stop raining so we can get out of here in the morning?”; “Is this really the smart thing to be doing with my life, instead of slaving away behind a desk working for the man?” I didn’t know the answers to any of them. But I did know one thing: I was about to find out whether or not I was ready for this trip. Perhaps I should digress and go back a few days to when we were frantically getting ready to go. We had not been out on the boat in over a month–a few weddings and visiting friends and family had kept us away–so by the time August came, we were ready to do a little cruising in the warmer dryer summer months. I had been on the boat for a week, doing work on her and getting her ready for a long weekend of cuising the Elizabeth Islands. For our first voyage from our new home port, we wanted something simple. And since we hadn’t outfitted the boat completely, we needed a destination with a restuarant, or it would be cheese and crackers for dinner. We went down to the boat Friday night in order to wake up on board and head out to our next destination as early as possible: Mattapoisett. We bought our sailboat in November, but by May we had yet to take her for a sail. As I explained to my nervous wife how to release the dock lines we prepared to for our maiden voyage. It was nothing much really, just a nice sail around Boston Harbor, then an overnight in Hull, Massachusetts, at the entrance to Hingham Bay, but since we were departing from Hingham, this wasn’t the most ambitious plan. We just wanted to start to get to know our new friend a little.